Find inspiration and great vegetable gardening tips in this growing collection of home vegetable gardener interviews. Share in the knowledge and experience of successful food growers. Whether you’re a vegetable garden beginner or a gardening expert, there’s always something to be learnt from the experiences of other gardeners. A single vegetable gardening tip from an experienced vegetable gardener can save you hours of work. I hope these stories encourage and support you. Thank you to all the contributors who have generously shared some of their best vegetable gardening ideas. Scroll down to share your own best vegetable garden tips. Bill and Karen own a well-organised and productive 23 acre block in south-eastern New South Wales, Australia. 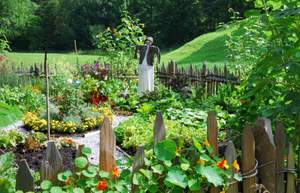 Their home vegetable garden and orchard are steps from their back door. Bill’s comment, “I like feeding myself,” pretty much sums up their motivation to be self-sufficient on their Carwoola block. Including a raised bed vegetable garden in your backyard is an ideal way to foster your children’s interest in home vegetable gardening. The fresh vegetables grown in Annette and Kim’s kid-friendly home vegetable garden rarely make it from the veggie patch to the kitchen table. Our polytunnel story is a long and ongoing one. Dubbed “Polytown” by our daughter, Polytown spent about ten years in the imagination and took more than three years to build. However, it’s been well worth the effort as it continues to provide us with an abundance of vegetables despite unpredictable and harsh frosts. The best vegetable garden tips come from people who really work in their own home vegetable gardens. Check out the best vegetable gardening tips other Growing Raw visitors have to offer, and share your own.